These black on Yellow Reflective 6" x 1 1/2" reflective decals are made with 3M 3200 Engineer Grade Reflective sheeting and are used in conjuction with Shelter-In-Place 6" x 6" decals used for Homeland Security Applications in New York City or any other local where regulations specify legible markings with reflective feature. 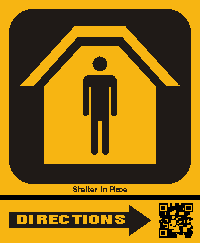 A custom QR Shelter-In-Place Direction Decal can provide a link to specific, up-to-date directions to the closest Shelter-In-place location. Directions to the Shelter-In-Place location can include Written Instructions, Diagrams, Photos and Videos. A) Written Instructions may include taking several turns, stairs, elevators and other specific directions. Written Instructions can be done with a series of pages, each to be clicked upon arrival at the next landmark. Written Instructions may also be all on a single page that the client refers to as each landmark is reached. The single page system is best if there is a chance internet access will be interupted when the client walks through the building. B) Diagrams are useful for showing building layout and directions without the use of language. Diagrams are usually on a single page that the client refers to as each landmark is reached. C) Photos are useful for showing building layout and directions without the use of language. Photos are usually on a single page that the client refers to as each landmark is reached. D) Videos are useful for showing building layout and directions without the use of language. Videos are usually on a single page that the client refers to as each landmark is reached. The QR can link to your website page, or if you'd rather, we can place your Written Instructions, Diagrams, Photos and Videos on a custom page to be maintained at www.shelter-in-place.info website. Call Anytime Sign at 1-800-582-1554 for information and pricing for this service.